Contact Wabash Valley Chrysler about the most capable heavy-duty pickup truck ever! The 2019 RAM 3500! With the ability to tow up to 35,100 pounds, that is more than any other heavy-duty diesel truck in its class. When pulling a trailer or boat, the new RAM 3500 will make any job look easy. 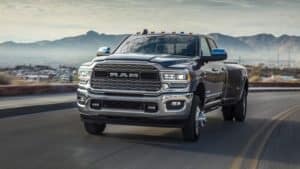 Learn more about the 2019 RAM 3500 by contacting Wabash Valley Chrysler! Serving Marion, Peru, and Kokomo, Indiana.